This could be the logo of a poetry club indeed. The same emblem can be found on a surimono by Hokkei depicting the Noh play 'Takasago', ca 1825. 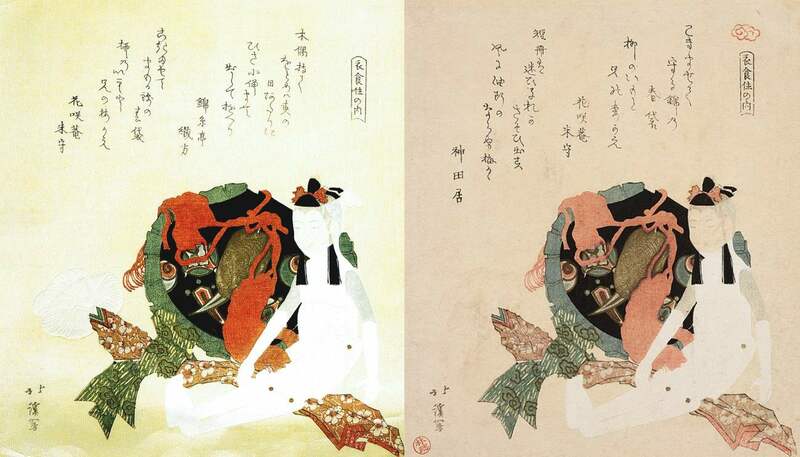 (https://ukiyo-e.org/image/met/DP123624). The series title reads 'Ishokujû no uchi' (衣食住内 - 'Clothing, Food and Shelter). Apparently, there are two different editions. A deluxe edition with a yellowish background with poems by Kinshintei Orikata and Kashôan Yonemori. This edition, without the red logo, issued in 1818 is illustrated and commented in 'The Frank Lloyd Wright Collection of Surimono' (p. 90-91). An alternative edition with the red cloud logo on top of the title cartouche has two other kyôka poems by different poets. Another surimono from the same series, also with the red cloud logo, can be found in the collection of the Munson Williams Proctor Art Institute. Surprisingly, this print bears also the hand-stamped red collector's seal of Hayashi Tadamasa near the signature (http://collections.mwpai.org/objects/7989/food-clothing-shelter;jsessionid=95B911EB2592BD8A124EF4D56FD7982D?ctx=395fa6eb-5cf5-40f7-bba0-8e2c61a08a78&idx=4435). Remark: Roger Keyes does not mention Meiji editions of this series in 4The Art of Surimono'volume II.